Tampa Florida is headquarters for Capital Machine® since the early 1980s. In addition to providing administrative services for the company, the 14,000 square foot facility also includes a modern, state-of-art Showroom with a broad range of equipment under power. Service support for customers across the south is coordinated from Tampa. Customer inquiries for service, parts or training are directed to Tampa and facilitated by one of our experienced staff members. We maintain skilled professionals to assist customers over the phone and to coordinate any further services. When required, Tampa personnel will schedule and dispatch technicians from our strategically-located staff of 18 Field Service Engineers spread out around the southern states we serve. Our headquarters is conveniently located on Tampa’s East Side less than two miles west of I-75 and five miles south of I-4. The Tampa Airport is less than 30 minutes and the Orlando Airport is approximately one-hour to the east. Customers can schedule a visit to our Showroom to see a comprehensive display of metal fabricating equipment under power. For customers that also have machining needs, we are conveniently located adjacent to the HFO Haas Factory Outlet. Capital Machine’s Atlanta Technology & Training Center is conveniently located just outside the I-285 beltway on Atlanta’s northeast side and just 2 miles north of I-85. 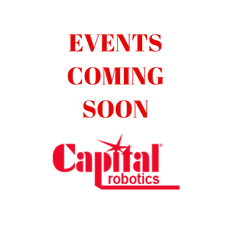 Atlanta is not only Capital’s largest showroom, but also home to Capital Robotics. In addition to the broadest line-up of demonstration machines, Atlanta offers our most expansive display of Robotic Welding Systems & Technology. The Atlanta facility serves as Capital’s primary Training location for customers. Classes are conducted on a variety of machines, software and systems. Capital Machine’s Texas Technology Center is conveniently located on the north side of Dallas. Our facility includes a comprehensive display of metal fabricating equipment & Robotic Welding Systems under power. Customers can schedule appointments to evaluate machines and gain hands-on experience. Specific models routinely change but customers can typically see state-of-the-art equipment for cutting, punching, bending, shearing, sawing, robotic welding and more! We invite you to make an appointment to visit any of our Technology Centers for your personal review and evaluation.